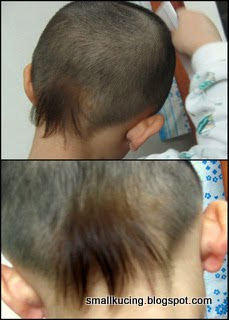 Jeng~jeng~jeng~ Here is my "tail". Mamarazzi colored her hair and I want too. Thus she colored my "tail". Can't see much as it's dark brown. I wanted blond but Mamarazzi veto it. Wah, in conjunction with the Year of the Tiger.....rowllllll! Wow wow wow!! So fashion! I can see the brown color tail!